Okay, so I have to admit that I wasn’t too enthused about this Busy Bag from our Busy Bag Swap. It seemed so simple that I figured no one would find it too exciting. Well, was I ever wrong! This is, by far, Silas’ favorite Busy Bag Activity to date. He has taken the plastic colored eggs in and out of the egg carton more times than I can care to count. And he’s enjoyed every minute of it! We were also thrilled to discover that Silas could match all of the colors of the eggs to the colors colored on the bottom of the egg carton. The girls and I had so much fun cheering him on as he did it right and then we couldn’t wait until Jesse got home so we could show him, too! See more details on creating an Egg Carton Busy Bag here. Find more Busy Bag Ideas here. My son Khalil got a real plastic set like this for his 1st birthday and loved it he played with it for months non stop. Thank you for the very Frugal version!!! u can also put the letters of his name, abc’s, etc to match the tops/bottoms of eggs(ie: A with a, etc). Wow, really? These posts are really proving that it doesn’t take a lot of money to keep a child occupied! I never even thought about that.That looks like something both of my kids would enjoy!!!! Perfect timing as I just found our leftover plastic eggs from Easter when I cleaned out the closet last weekend. We’ll certainly add this to our box of busy bag activities. Thanks for posting these! What a cute idea! Sometimes it really is the simplest things that keep kids entertained. 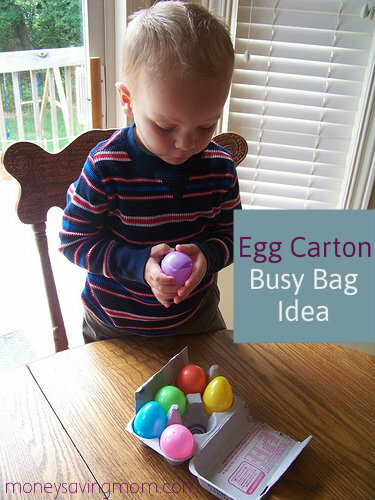 This is very inexpensive too, using egg cartons and plastic eggs – those always go on clearance after Easter and I see them often at yard sales, also. He is the perfect age for this kind of toy. Great idea! Do you mind telling me how old Silas is? I’m expecting my first baby, and I’ve been reading these busy-bag posts with the intention of filing away all these ideas for the future. I just don’t know what age they’re good for! I’m not Crystal, but she said in a post last week that he turned two last May. According to the Busy Bag Swap site, this one is for the young toddler: ages 1 – 2 only. Some of the activities can be tweaked for older children so that they grow with the child as well if you get creative. I love activities like these for my little ones. Thanks, we’ll have to try this one too…my two year old loved “pom pom stuff”. Gotta love cheap entertainment!! How funny that you posted this! We have a big box of fake food for the kids’ mini kitchen and they love playing with the eggs. I have given them several egg cartons to put the eggs in, which they love. But we only had 3 fake eggs, and I suddenly remembered all the colored Easter eggs in the attic. I got down a bunch more and filled an egg carton for them. Instant hit! They have both loved playing with them so much. I am definitely going to keep extra Easter eggs on hand for things like this. That is such a great idea! Thank you for that, I am totally doing this with my kids! I was going to buy some fake food, but I have Easter eggs in my garage right now! If anyone starts another busybag group i would love to participate! looks like the one you joined is closed now. What fun ideas! I ran some down to him and he was happy to see me LOL. Maybe be forgot them on purpose ???? One never knows ! Thank you for the cute pictures, your kids are lovely. Our youngest went back to college for her jr. year last week. Yesterday I was walking through her room and her full sock drawer was pulled out. Wonder what she is wearing. She has a car and is 45 minutes away so I guess if she needs socks she will come home and get them! Funny!!! I guess he is not the only one forgetting that stuff. he does not have a car so I dropped off a bag to him with a ton of other goodies in it. My mom said to make him get them at a store on campus. I could not bear to do that when he texted me asking me if I could take him some. LOL i am laughing because I forgot to mention he is a Freshman so I am cutting him some slack. Oh heck who am I kidding?? I just could not say NO to him, he is pretty awesome. I understand you! We have 5 kids and I have seen everything in the college years. I have gotten much less merciful over the years of having them in college. I used to go and wash the stacks of dirty dishes in our now 31 yr old son’s apt. Trust me, I would not do that for the younger ones! However, I am more than willing to go take care of them when they give me new grandbabies! LOL you made my day Lana! That is funny about the dishes. My husband keeps telling me to “cut the cord”.. It is terrible! This is good because I feel more “normal” now. I am having a serious time of missing my 18 and 20 year olds that both moved out on sat. I still have a 16 yr old but it has been tough for me. I can get though it!!!! right? 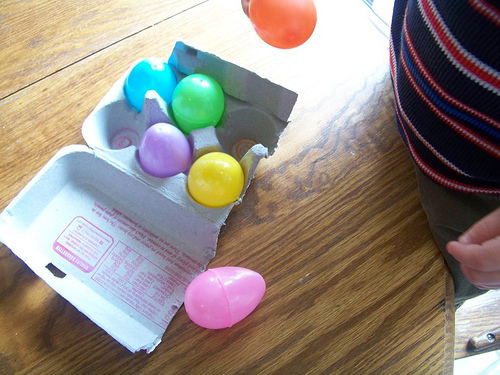 My little one loved plastic eggs…as soon as she figured out she could open them…well, that was more fun for her than me! (Think stale cheerios, chicken nugget bits…) We went to my grandparent’s house yesterday, and my grandfather was doing some woodwork. All my daughter wanted to do was stack scrap pieces of (sanded and smooth) wood, and cried when we left! The simple things really promote the most creativity. thank you for all of these ideas… my daughter is only 14 months old but I’m very much looking forward to creating all of these great things for her to play with! Especially when we’re blessed with more kiddos and Mama has to divide her time! Not to be a party pooper, but I did have a young son who once put half of a plastic egg in his mouth and then could not get it back out without my intervention. I’m thinking he was about 3 or 4 at the time. Okay, that might not be a common thing for kids to do (don’t know any other kid who’s done it), but you never know what idea will pop into those little minds. Oh my word! How scary. I had no idea an egg could fit in a little mouth like that!! Thanks for all of the ideas, Crystal- my boys LOVED the pom poms (I have a boy who just turned 3, and one who is almost 2). It kept them occupied (although fighting over the puff balls and screaming fits occasionally) but it was worth it as I also have a 2 week old! Keep the ideas coming, they are a MAJOR blessing right now for me!!!!!!! They are also VERY effective at plugging up toilets! All activities with children should be monitored for this reason. It’s really nice to have a child sit still for a few minutes with these busy bag activities, but their intensity and contented entertainment level is not an excuse to let him out of sight or at least ear shot. Kids can figure out some pretty mischievous and even scary things on their own in a really short period of time. And when they do, Mama needs to be their in short order! Thanks so much for sharing these ideas! And what a bummer that I got rid of all of our plastic Easter eggs at our garage sale…boohoo! My son’s therapist also puts a little something in each egg (same color as the egg), so then they can match each trinket to the color of the egg! Thanks for sharing my site! Looks like you’ve gotten some great Busy Bags. The swap is a great idea. Okay, my twin boys are 9 y.o. and they still love playing with our plastic Easter eggs. One of them just asked for some the other day. He has a non-verbal learning disorder so he loves simple stuff still (right now, he’s playing with Playdoh). I love these busy bag ideas. The kids I work with (ages 2-11) love pom-poms in general. They are a great sensory activity! I’m trying to think of ways to incorporate them into busy activities for older kids. Maybe to help with math facts like multiplication. So if anyone has any ideas or links to share, please let me know. We cut up our overwhelming supply of advertisement magnets and attached the magnet pieces to pom poms with hot glue. We have a few games we do with this. The first also uses number magnets. The kids use tweezers to count out and place the correct number of pom poms to match each number magnet and then put them rows on the frig or side of the filing cabinet. Also with the magnetic pom poms, I use wet erase markers and mark out sections on the frig. I put one magnet pom pom into each section so that each section has a different colored pom pom in it. The kids then color sort the magnets into each section using tongs or tweezers to place the pom poms. Another idea: you can get those Do-A-Dot pictures. Lots of them can be downloaded for free and should be easy to find if you google it. Attach the picture to the frig or lay it on a magnetic cookie sheet and have the kids fill in the circles with the magnetic pom poms instead of Do-A-Dot paints. We save egg cartons for my husband’s grandma who raises chickens and my son will steal them and put his Easter eggs in them. It never occurred to me to turn it in to an activity! Thanks! I had this for my project for the busy bag swap a few weeks ago. I put colored pom-poms inside the eggs to match the eggs for color matching. My son also loves this one. 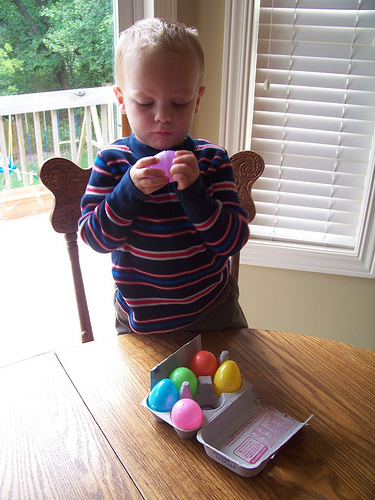 He has done a great job at matching colors and opening the eggs. We are loving exploring our busy bags! Our parents as teachers representative says that it’s also good to do something like this, but add an extra egg. That way, it’s problem solving and they get to figure out what to do with the extra one! I made these for my daughter last night. She woke up early this morning in a grumpy mood. I had to leave for work, I distracted her with her new busy bag of eggs! She LOVED it and was playing with her eggs happily when I left giving my husband time to get ready before they left for school. Ok, I’m very excited about this idea, but I do have to ask, how do you clean the egg carton? Eggs have the potential for salmonella so I never let my child touch what I consider to be a dirty carton. How do you clean them? So glad you are posting all of these! Perfect timing too! MY son had just started school and his little sister has been SUPER bored without him here to play with her. We’re making up one busy bag each day and she is loving them so far! I loved this idea so much that I got right up and made two – one for my son and one for my nephew!